Twenty acres of the 100-acre park are developed. Just under a million tons of limestone form the walkways and stairs--all purchased or scrounged in the area by Reverend Stotesbury and transported to the amphitheatre site using various forms of transportation. The centrepiece for one of the gardens used to adorn the archway of the Saugeen Indian School (1893) as its headstone. The design of the English Rose and the Canadian Maple Leaf reflects both the British and Canadian influence of the time. Twenty-eight drainage systems hold back the clay riverbank. 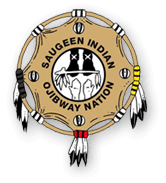 The Amphitheatre is located along Hwy 21 in the Saugeen First Nation. You will see a wooden sign at the entrance to the parking lot on the south side of the highway. There is no admission fee.